Ask fellow campers about "Travelers Rest / N Greenville KOA" and nearby attractions. 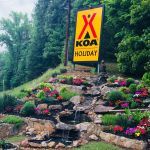 KOA campgrounds are earning more and more of our business due to most of their campgrounds being renovated and consistent with basic amenities across the board. 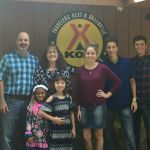 Traveler's Rest is a midline KOA Holiday within their three tiered structure of KOA Journey (the most basic), KOA Holiday (a bit more amenities and activities); and KOA Resort (destination style campgrounds). The levels are based on size and amenities of each campground. The park is within about fifteen minutes of North Greenville. Easy on and off the highway and sits back away from the road enough no road noise is noticeable inside the campground. Upon entering the campground, it was obvious to us some thought and effort had been put into landscaping creating a soothing, calm, and garden like atmosphere. The flowers and water feature are beautifully done. Check-in was fast, friendly, and convenient. We were guided to our site by the owner and he helped us to back into our deluxe patio site. The site was more than long enough for our truck and trailer. The utilities were placed very well and privacy trees and shrubs had been strategically planted. We loved that this site backed up to the creek. There was no need to level our trailer as the site was already perfectly level. Most all of the sites we saw were spacious like ours and very well landscaped. Landscaping timbers bordered each site and we thought this was a smart idea giving each site a neat appearance. There is a newer pavilion with ping pong, corn hole, and basketball. A pool is also nearby but it had not opened for the season. Our dogs loved the long dog run and we hiked a nearby small trail. The camp store is not huge, but has all necessities and some very unique camping merchandise. Showers and bathrooms are newer and very clean. The owners stay busy pouring hard work and love into this campground. We will go back every year. We camped at Travelers Rest / N Greenville KOA in a Travel Trailer. From start to finish, our experience was excellent. The campground is long and somewhat narrow, but the roads are easy to navigate and well maintained. A lot of tree cover, which I can imagine is pretty in the later months and beautiful in the fall. There is a creek that runs behind the campground and a walking trail that, due to the weather, we didn't explore. We stayed in the "Deluxe Patio" site (site 38) which has an area behind the site that the converted to a sitting area with lights, a swing and a fire pit along the creek. While it was somewhat chilly, we did enjoy sitting there for a bit and listening to the water flow by. The site was more expensive, but was worth it for that alone. The site itself was great - gravel but level with a long, wide concrete patio complete with table and chairs, charcoal grill and firepit. The site was more than long enough for our motorhome and toad. Wifi service is included and was quite speedy but the fact that this is the middle of January and the park wasn't very crowded should be taken into consideration. As far as cellular is concerned, both AT&T and Verizon have very good coverage and we had no issue with connectivity. We met the owner and he explained that he had reduced the number of "primitive tent" sites to two (the absolute minimum for a KOA campground) and placed a premium on those. It was evident that he wants to maintain the quality of the park and it definitely shows. We, too, were warned of the high water pressure and also acknowledged that we had a regulator to prevent blow outs. It is nice to see a park that is well maintained, provides excellent utilities and has ownership that is genuinely concerned about the comfort of their guests. We picked this park as a somewhat convenient stop on the way home from our visit to Freightliner for service, but have definitely added this park to our list of places we want to return to. We camped at Travelers Rest / N Greenville KOA in a Motorhome. If you're coming from the north down US25, you will need to make a U-turn to get to the park. There is a roadside store about 1/4 mile down the road that I was able to turn around in - I don't think I could have made a U-turn in the road. Something to be aware of if you have a long rig plus toad. This is for sure one of the best parks we have ever used! They greeted us as we arrived! and then escorted us to the site and helped us back in, showed us every thing, just over the top greeting. The place is as clean as can be, all gravel roads and sites. Never a problem with water, and it rained a lot during our stay. Plenty of shade, and quite. 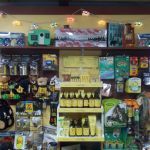 The location is great, 6 miles from Travelers Rest downtown, 17 miles to Greenville and surrounded by several other small interesting towns. We arrived planning on staying 4 days and stayed for 10. 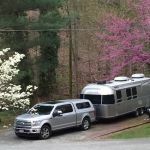 We camped at Travelers Rest / N Greenville KOA in a Fifth Wheel. several good restaurants in town, But Shortfields was excellant. We rode our bikes on the swamp rabbit trail that goes thru town, very nice, paved and level for us beginners. Small campground with about 38 spaces and just a few that will hold a real big rig. However the sites that do hold a big rig (Deluxe pull through patio sites) are really long and very wide and spacious, level and easy to maneuver into. 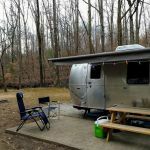 The park is run by live in owners and is very well maintained, clean, and far back enough from US 25 that it is also very quiet. Pool, dog run, playground and small hiking trail provide good amenities. We would stay here again when in the area. We camped at Travelers Rest / N Greenville KOA in a Motorhome. Swamp Rabbit Trail is a great biking or hiking trail that goes from Travelers Rest into Greenville (about 19 miles each way). Greenville about 20 minutes away. Travelers Rest has good restaurants, supermarkets, hardware stores, Walmart, etc in case you need to pick up something. The owner of this KOA was always very helpful. He even went above and beyond normal customer service. It's a relatively small park, but very private and quiet. We camped at Travelers Rest / N Greenville KOA in a Travel Trailer. Check in process was completed in a friendly and efficient manor. Was taken to and help backing into site. Sites were level,clean and roomy. Water pressure was high but was told by person at front desk ensuring we had a reducer so not to damage the rv. Restrooms and showers were clean. 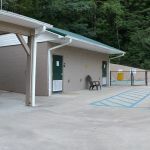 The campground was quiet and close to Greenville and downtown Travelers Rest. Plan to stay there again when in the area. We camped at Travelers Rest / N Greenville KOA in a Travel Trailer. Liberty Park in Greenville SC is nice day trip. This KOA is very remote, fully wooded and next to a stream, so nice and quiet. The sites are mostly large and level with landscape timbers around them which makes it feel more tidy, and the gravel roads are well maintained. There is a a little bit of landscaping other than natural trees. Overall maintenance is excellent. Due to the trees we did not get Dish satellite, but their free cable was very good with 48 channels (ask for the cable guide that I located online). Wifi is weak but you're fairly remote so no big surprise. The campground is located on a smaller highway so there is some road noise, but our site was way in the back and we didn't hear it at all. 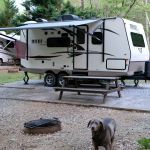 We camped at Travelers Rest / N Greenville KOA in a Fifth Wheel. Very remote so bring everything with you. Nice and quiet though. I had to downgrade this park because of the danger of approaching this campground from the north. A serious accident is a certainty. No vehicle over 25 feet should attempt the U-turn off the adjoining four-lane highway without carefully being briefed by the staff or going a mile or two beyond the park and turning left onto a road which which allow you to go around the block and come back. By the way, they have killer speed bumps. They will jar your teeth. We camped at Travelers Rest / N Greenville KOA in a Motorhome. Hiking is nearby, as is Carl Sandburg's home is interesting, though it will be empty of furniture until late 2018. The Falls at Reedy River in Greenville is nice as well. Learn about Shoeless Joe Jackson while you are at it. Awesome experience. The owners went out of their way to be helpful and friendly. Owner led me to my site and then loaned me blocks to adjust level (from now on I will carry my own because don't think all parks will be as caring) and both owners made suggestions where appropriate. Nice with picnic table on concrete pad. Fire pit on site. We camped at Travelers Rest / N Greenville KOA in a Motorhome. We stayed here one night on our way to another destination. I have stayed at many KOAs and generally find them to be adequate but nothing special. This one is special. The setting is beautiful. The campground is small so there is no congestion. Many of the sites are small and there are only 2 pull-through sites. The couple who owns the campground go out of their way to be friendly and helpful, even providing their private cell number if you have a problem. I want to go back and spend more time here. We camped at Travelers Rest / N Greenville KOA in a Motorhome. This is near Greenville, SC, with many choices for all ages. It is also near the mountains of SC. I would like to go back and sit in a comfortable chair for a few days. Great park with lots of shade. Pool was open and very clean. Also has a dog run so they can be off lease for a while. Friendly, helpful owners with hard working kids. We camped at Travelers Rest / N Greenville KOA in a Motorhome. Travelers Rest is near by with restaurants, shopping and parks. This is a small compact park but they did a great job with it's setup. The sites are positioned for maximum privacy and the whole campground is maintained to a very high standard. We were lead to our site and helped with packing in. A really nice service was picking up our propane tank and delivering it back full. The campground was mostly full the 3 days we were here so it must have a very good rep. It was still not fully open due to the time of year but I would venture a guess that everything would be top notch. We would definitely stay again. 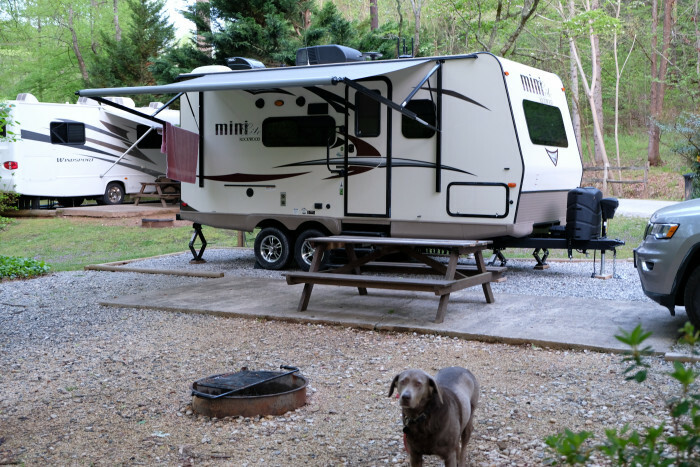 We camped at Travelers Rest / N Greenville KOA in a Fifth Wheel. There were several battles in the local area that were a turning point in the American Revolution. Cowpens NB and Kings Mountain are eyeopening. Travelers Rest is 12 minutes south for shopping and some dining. Greenville is only 20 minutes away, and has pretty much anything you need. Far from town. Handicapped inconvenient. Greenville is only 20 minutes away. Great restaurants, Saturday farmers market, great zoo. Lots to see and do. Swamp Rabbit Rails to Trails paved bike path is great. Most of it is under a canape of trees, so even on a warm day, it's shady. Best done on a weekday, because it is popular. Are you affiliated with Travelers Rest / N Greenville KOA ?